SURPRISE. A writer sees life as a metaphor. 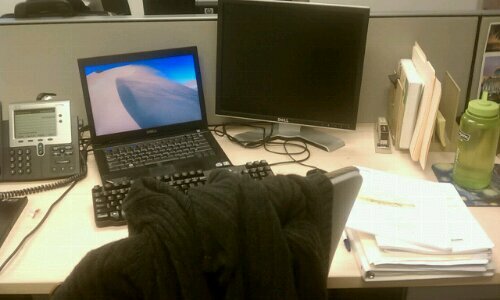 On Friday, I gathered up my stuff and said goodbye to the office. As my last act, I took a box filled with everything I’ve been using for the past three years-econometrics textbooks, notes from my statistics classes, SAS training manuals, pictures, and shoes-and lugged it out of the door. I left my pass on our office manager’s desk and prepared for the hardest part: taking out the box. I initially thought I could carry the box out on my own, but it was heavier than I thought and gave me images of hernias. However, I wanted to be alone in my finality, so I didn’t bother anyone and I somehow groped it to the elevator, out on the street, and propped it up against a plant near a bank. People looked at me. I kicked it halfway down the block and somehow lugged it across the street. At last, I got to the garage where I parked and dumped the box in my trunk, my arms screaming sweet relief. And I realized that the box is a metaphor for my last job and last life situation. Although I learned so much and am extremely grateful to have had the experience, there came a point where I knew I needed to move on, both for personal and professional growth, and the stress of needing to move on, of figuring out how to logistically relocate to Philadelphia, constantly weighing the pros and cons for everything, was like a huge box of books sitting on my nerves, for the past six months, which I didn’t realize was extremely heavy until I didn’t have it anymore. The minute I left and realized that my future was, for the moment, clear and unencumbered by the what-ifs constantly running through the circuits of my brain, was the moment my back eased up and my brow unfurrowed. I knew that the next few months will be tough as Mr. B and I tightrope from DC to Philly weekend to weekend. But I wasn’t thinking about that last Friday, only about my week off, which starts today, and about how beautiful Georgetown looks in the fall. And that’s when I cranked up the volume on my car stereo and sang all the way across the Key Bridge.